I love the end of the year. Finishing is always so much fun! I have a few straight setting options for your consideration. I did mine is a straight set with lattice strips and multicolor cornerstones. What are your plans? Cut 49 sashing strips 5.5 by 1.5 inches. Cut 49 sashing strips 8 by 2 inches. Cut 49 sashing strips 10.5 by 2 inches. Cut 31 sashing strips 15.5 by 2 inches. Anna is home from college this week and we have a family wedding coming up in North Carolina. The hurricane was far away from our side of the state and we never saw more than a windy day out of it. It is horrible to see the devastation that it has caused. Love all your Squared Away blocks! I'm thinking of an on point setting for mine. But I've not had all the blocks up on the design wall as yet, so we'll see when I get these last three done. This is looking great, Angela! Thanks for all the cutting dimensions! I love your squared away 2018 rainbow scrap sampler, Angela! I'm working with 7.5" blocks with plans for a baby quilt, a gilt for a great grand baby due soon. 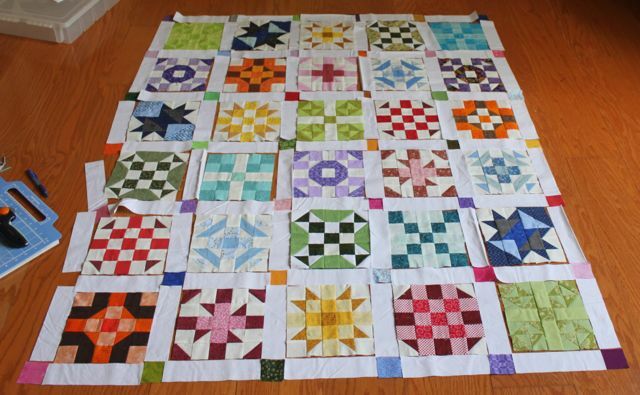 I love this time of year when we work with out RSC blocks to create scrappy, colorful, fun quilts for family, friends and charity. Thank you for hosting this most inspiring and productive RSC sew along. Glad to know that you are save. Great settings, it's fun to see what will be done by each of us! I love your multicolor cornerstones. They add even more happiness to the quilt top. Thanks for the cutting guides. So helpful for a variety of quilts. A collection of absolutely beautiful blocks!